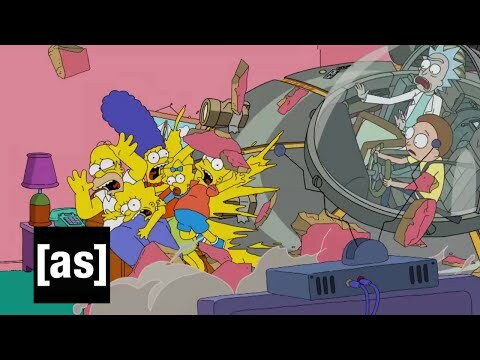 Emoto composer Ryan Elder has scored a crossover bit, featuring Cartoon Network’s Rick and Morty, which aired May 17th in the Season 26 finale of The Simpsons. In this episode of The Simpsons, Rick and Morty literally drop-in on the beloved Simpson family in another one of their outlandish adventures throughout space and alternate universes. Check it out below! The Simpsons, created by Matt Groening, James L. Brooks, and Sam Simon and written by Michael Price, first aired in 1989 and has been a television favorite for decades now. Rick and Morty is a relatively new animated series, created by Justin Roiland and Dan Harmon, which will celebrate it’s Season 2 premier on Cartoon Network’s [adult swim] Sunday, July 26th. If you can’t wait until July for more Rick and Morty, catch up with Season 1 online at [adult swim]. The Simpsons will be back with Season 27 in late September of this year.